For the past few months, Lauri Stallings, an innovative choreographer in Atlanta, has been having deep conversations with Rev. Howard Finster, the folk artist and evangelical preacher who died in 2001. Their tete-a-tetes have concerned how she might create a contemporary dance installation at Paradise Garden, the visionary art environment that Finster built around his home in Summerville, Ga.
"Howard was very aggressive with me when I first got to the gardens several months ago," Stallings recalled. "I wouldn't get out of the car because I felt him so near." How can an artist create in a space that seems overwhelmingly inhabited by another artist? The swampy, four-acre Paradise Garden exudes Finster's presence. Hand-painted messages and Bible verses await at every turn. Mosaic concrete sculptures and paths glitter with glass, mirrors, cracked dinner plates, and funky found objects. Collections of rusty sprockets and wheels hang in weathered shacks. "The language I work with is so turned on to all the senses. There was great challenge in finding this separate space inside of me that I could work from because Howard is everywhere," she said. "I begged him to let me in, on my own terms, without reference to a singular god." Early Saturday evening Stallings' dance troupe named "glo" executed a site-specific dance installation at Paradise Garden that successfully linked the choreographer and folk artist's worlds. The two-hour-long work was intended to translate dimensions of Finster's spirit into flesh. Titled "choir B: a physical installation on finding the light," the work was the eighth show in "The Traveling Show: Revolutionary Public Art Tour of Georgia," a series that has taken experimental dance to small towns across the state. Arriving at the garden with a busload of arts enthusiasts traveling from Atlanta, 85 miles away, I was greeted by strains of Elvis Presley's "I Can't Stop Loving You," which imparted a haunting note. Finster was an avid Elvis fan, creating hundreds of wooden cut-outs of the folk hero. While nodding to that relationship, this song about memory addressed the mysterious interior states that the dancers sought to communicate. 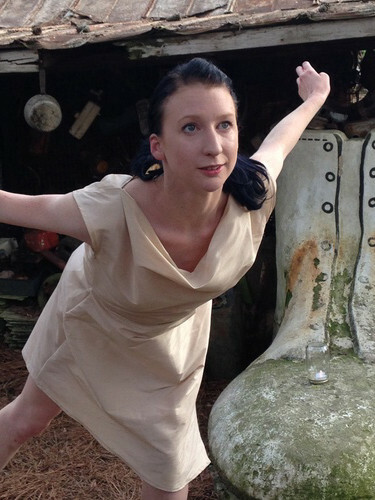 Dancer Kristina Brown sat on the front porch of Finster's cottage studio, slumped on a red 1950s glider with a rigid posture and a fixed gaze. Clad in a simple beige dress with dirty shoes and peroxide blond hair, she brought to mind an impoverished Appalachian woman in a catatonic state, lost in her own world. "I wanted her to embody the intensity that Finster had when he was working," Stallings said. Stallings designed varied vignettes throughout the compound. Six dancers migrated through the garden, loosely trailed by audience members who became part of the installation with dancers sidestepping around them. Dogs barking, birds singing, cherry tree blossoms, a neighbor's lawnmower humming, and two little girls mimicking the dancers all added to the multi-layered experience. About 100 people attended. Music ranged from R.E.M. and Talking Head songs (Finster designed album covers for both bands) to Finster's own recordings and shape-note singing, which is rooted in southern Appalachia. Stallings insists her work is an installation, not a performance, because it is not projected from a proscenium with the audience seated. A high-profile choreographer in Atlanta, Stallings previously performed with the Hubbard Dance Street Chicago and was named a 2005 Chicagoan of the Year for her choreographic debut, "Moody Hollow." A state of precariousness infuses her work, and this is one of the ways she connects with Finster -- through human vulnerability. Noelle Kayser inserted one of her legs in a drainpipe that ran through a concrete mosaic sculpture, and then she froze as if transforming into a stone statue herself. Mary Jane Pennington repeatedly perched on the balcony of a goat shed and dove head first into the arms of her colleagues. 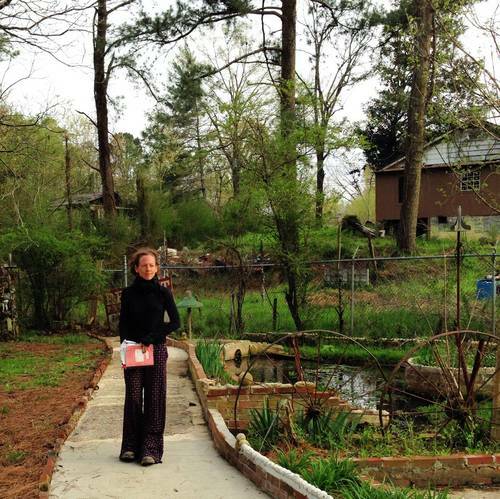 Standing near a brook, Jennifer Clark balanced on one leg for an interminable time after other dancers fled away. Bathed in a gentle sunset light, she was a vestige left behind. I thought the work was ending here until dancers began guiding the audience into Finster's "meditation chapel." The chapel is one of the places where Finster rested from his non-stop working. As we gathered in the intimate space, the final surprise was a passionate embrace between two women dancers as Elvis crooned "Love Me Tender." Surrounded by painted Biblical verses, Virginia Coleman and Kayser sculpted their bodies in soft, rounded gestures, their arms and hands cradling each other as they kissed. Afterwards Coleman squeezed into the pew beside me, took my fingers, and raised my arm with hers. Sean Hilton, the sole male dancer, guided a male audience member in front of a white wood coffin/altar that was overhung by one of Finster's famous angel cut-outs. Hilton stretched his arms forward and waited. The two men stared at each other in a Marina Abramovic-like moment. Then the guest decidedly walked over and hugged Hilton. Jordan Poole, executive director of the Paradise Garden Foundation which is restoring the site, said, "The meditation chapel offers people an opportunity to observe themselves and how they interact with others." "It's what Lauri really was trying to get out of the performance -- to show the different layers of ourselves, what it means to be human." Check out these additional photos from the April 5 installation and tell us what you think in the comments.